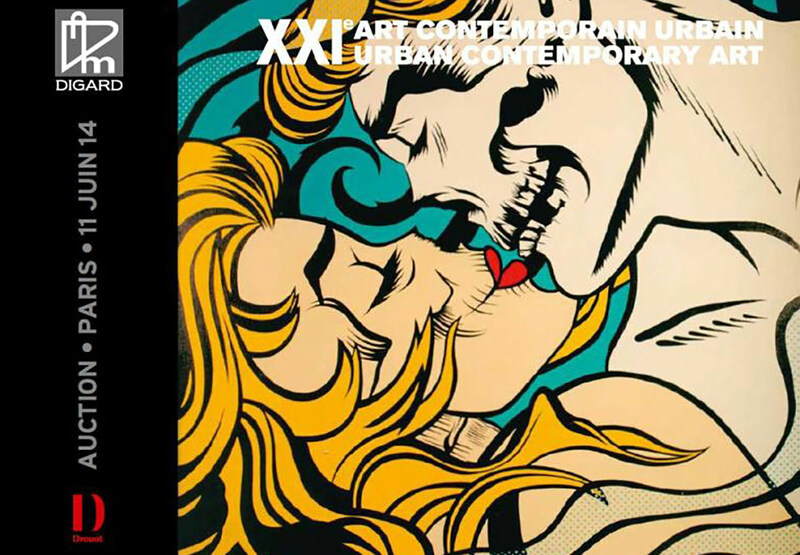 On Wednesday, June 11, the auction house Digard will host Art Contemporain Urbain, an auction of contemporary urban art works. Some of these pieces will be done by artists recognized as masters in the genre, while others will be by new and emerging artists. 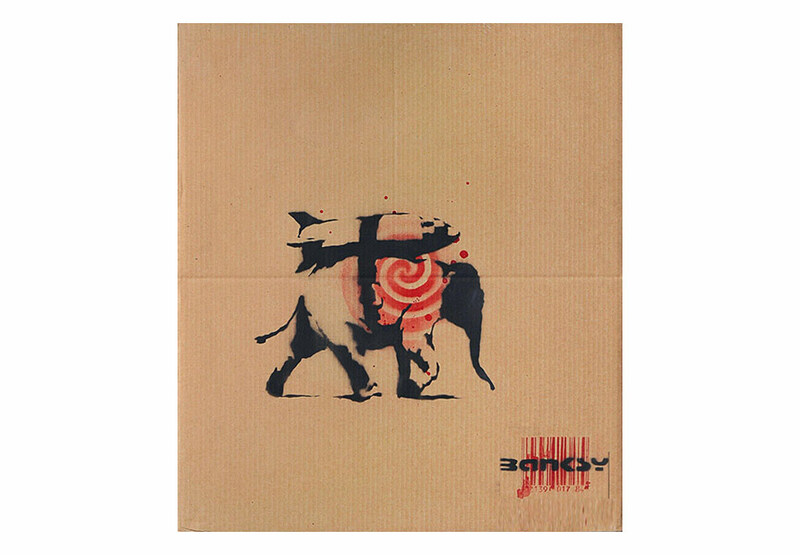 The works for sale come from around the world and include pieces by artists such as Shepard Fairey, Banksy, Jacques Villegle, Sickboy, BEST/EVER, Pejac, Rero and more. In addition to the auction, a special live-painting event will take place by eight artists. The pieces created will also be auctioned off. Those participating are Seth, Cope 2, Miss Tic, Nick Walker, Mear One, Logan Hicks, Katre, and Indie 184. Here are some of the highlight works from the upcoming auction. 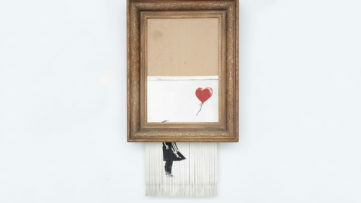 The most famous street artist of all is obviously also an essential part of the Art Contemporain Urbain auctions. One of the highlight pieces is “Heavy Weaponry”. The work is spray paint on cardboard and was a gift by the artist to the original owner. The cardboard is signed with the artist tag and barcode in the lower right-hand corner. 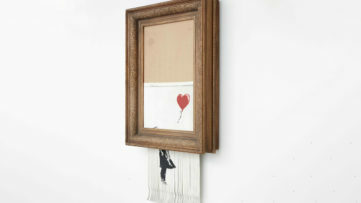 The estimate for this unique piece is between €60.000 – €80.000. You’ll find it at lot number 67. The next rare piece is entitled “Formica Flag – Gold”. 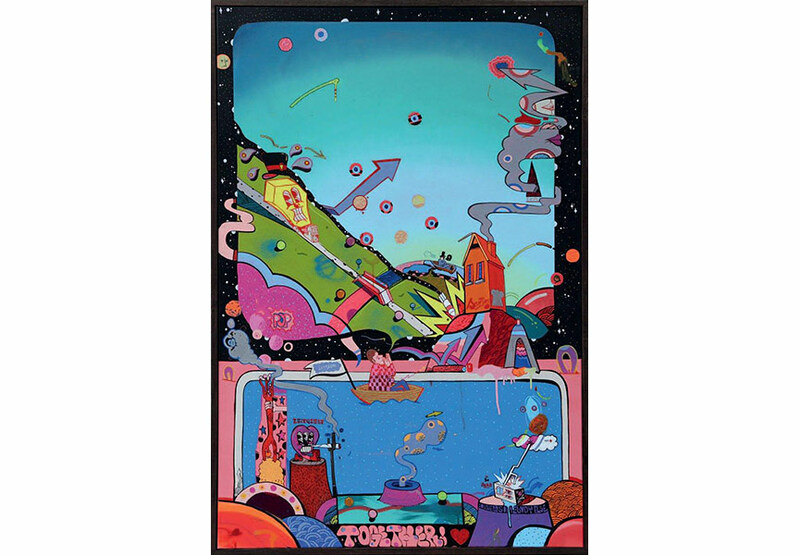 The 50cm x 70cm artwork is number 18 in an edition of 23. 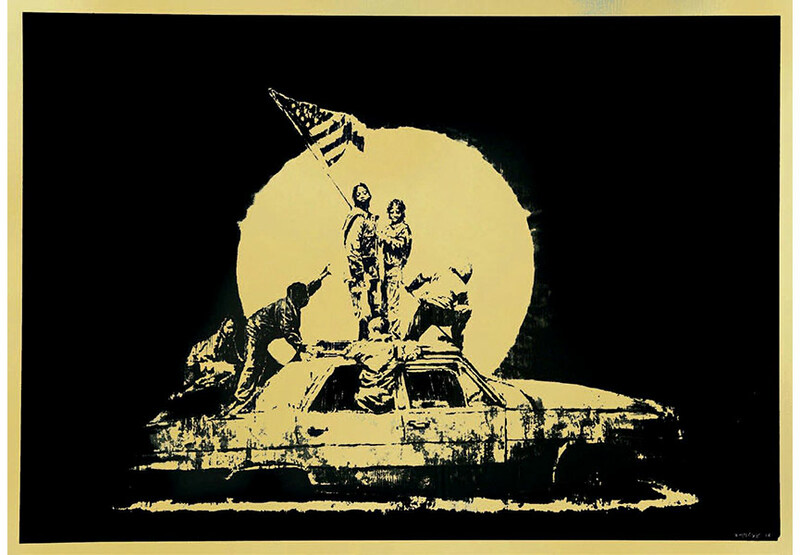 The black and gold silkscreen print is on a Formica metal sheet that is signed and numbered with a certificate of authenticity from “Pest Control Office” (Banksy’s own certification). You can find this this work at lot number 56. Shepard Fairey is an artist from the United States who became very famous for the HOPE image featuring President Barak Obama. 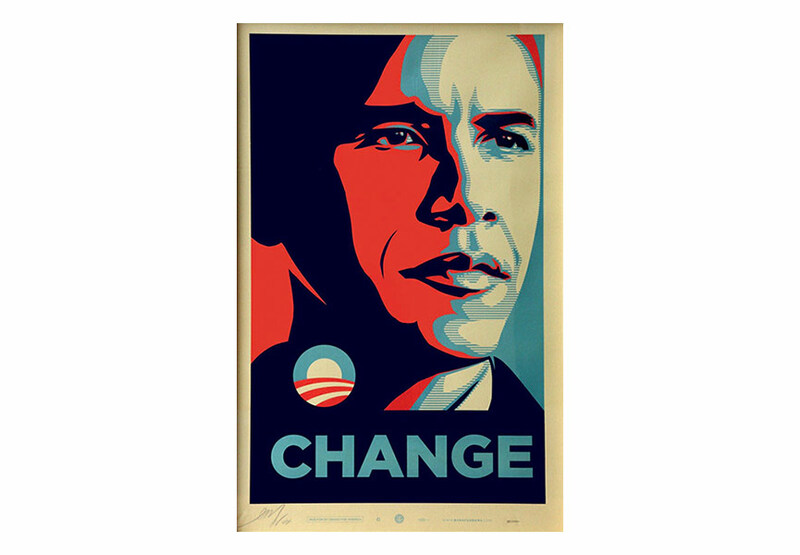 One of his items included in the Digard auction is “CHANGE,” another piece featuring President Obama that Fairey created in 2008. The offset lithograph is number 30 of a 5000 edition. You can find the 99.5cm x 62.5cm print at lot number 14. Originally a fine artist, Sickboy later turned to graffiti to spread his message. He mainly creates freehand images and is most known for his “Save the Youth” slogan and his temple logo. The artwork up for bidding is mixed media on canvas that is signed and dated in blue marker on the back. The estimate hammer price his 2013 piece “Lucky You” is €4.000 – €6.000 and will be available at lot 120. 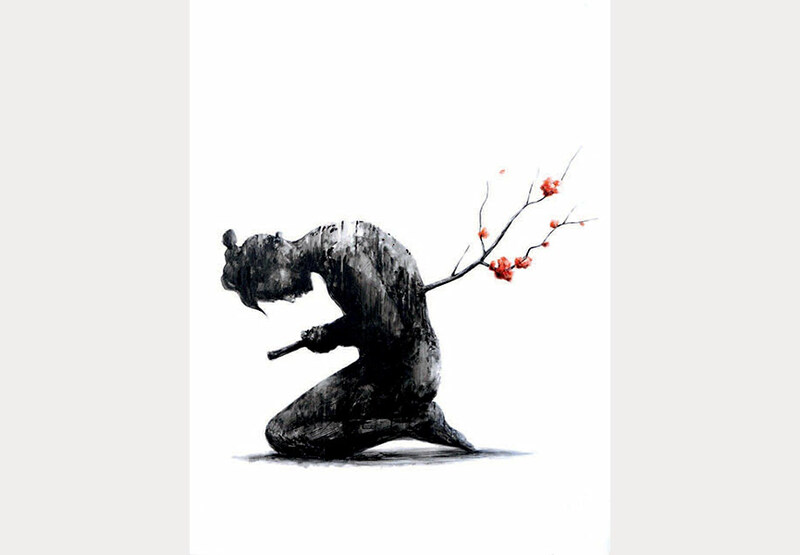 Seppuku under lot number 83 is the original of Pejac’s recently released first print ever. The original is acrylic oil on a 116cm x 89cm canvas. The canvas is signed in black marker on the back. The estimate for this beautiful work is €3.000 – €5.000. Considering the recent print release this work is likely to worth much more already. BEST EVER is an artistic duo made up of Neil and Hadley, two artists who combine graffiti with photorealism to create very different pieces of street art. At lot number 162 you will have the opportunity to bid on this beautiful figurative painting. “Axis” is 116cm x 76.2cm of spray paint and emulsion on canvas. Jacques Villegle is a living street art legend. 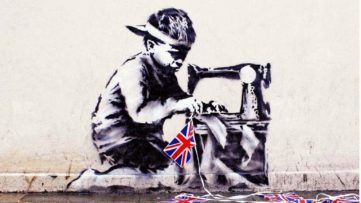 The artist born 1926 has been doing street art before all of us even knew the term. This rare piece by the French pioneer is accordingly estimated to achieve €35.000 – €45.000. 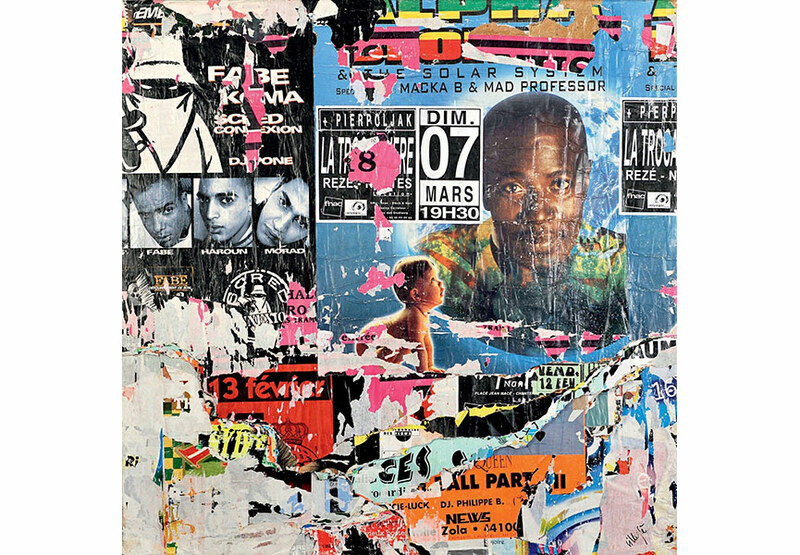 The 140cm x 140cm collage is made from posters mounted on canvas. “Mad Professor” can be found at lot number 46. 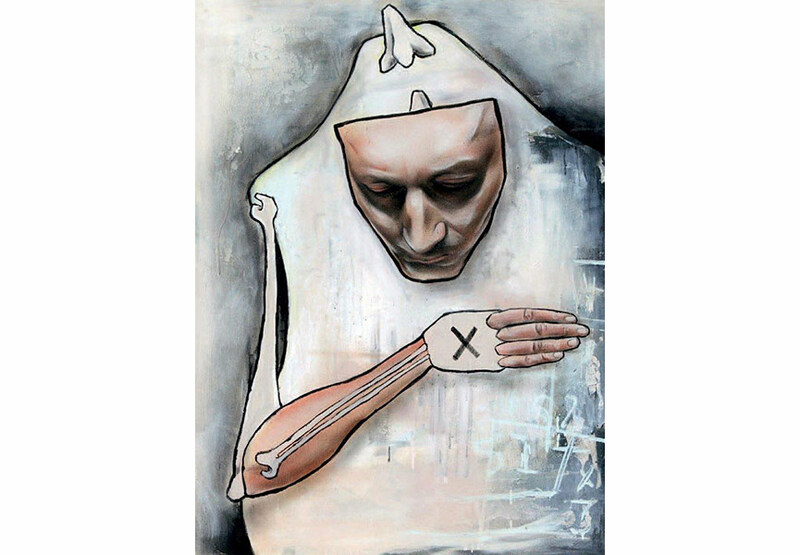 Another new artist, Rero creates art that questions itself and its context. His work is considered to straddle the line between conceptual art and urban art. 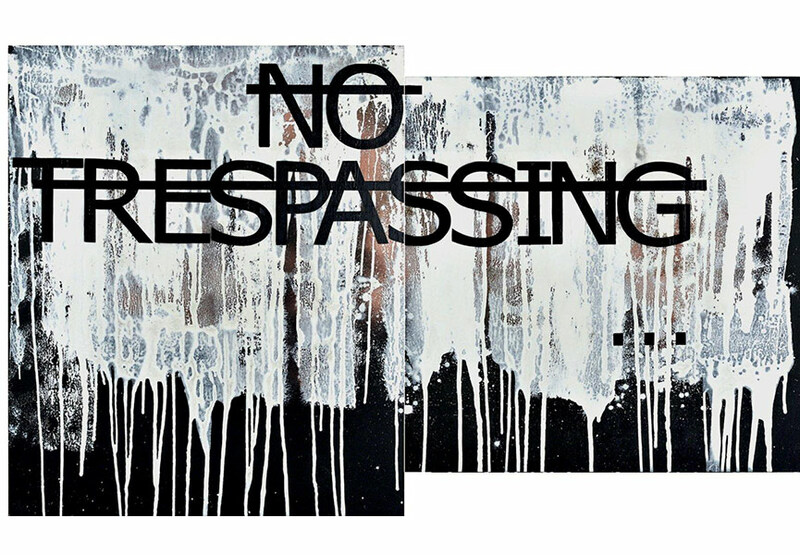 The diptych “No Trespassing” is listed as lot 40.